Polls show the contest for Arizona’s open U.S. Senate seat is virtually tied with only a handful of days left in the campaign. KNAU’s Ryan Heinsius reports, the Democrat in the race, Congresswoman Kyrsten Sinema, recently visited northern Arizona to speak with locals about a range of issues affecting the region. Democratic Congresswoman Kyrsten Sinema speaks with local seniors in Flagstaff Tue, Oct. 30, 2018 during the final week of her U.S. Senate campaign. 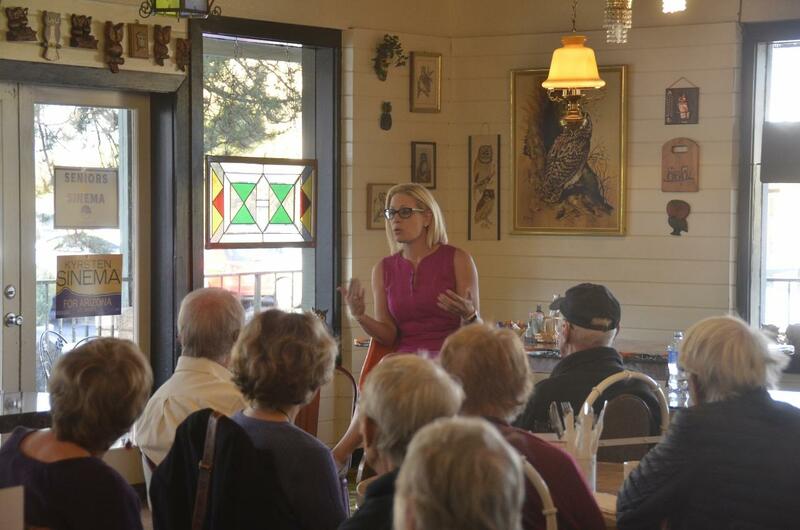 Sinema met with a few dozen seniors at the informal campaign stop at Flagstaff’s Toasted Owl restaurant Tuesday. They discussed gun violence, public lands, the country’s political climate, and healthcare, an issue she’s made central to her campaign. "Up and down the state, people have told me what they’re most worried about is having access to affordable healthcare. Those who have insurance are worried that they can’t afford it and it’s not good enough; those who don’t have it are worried that they’re one disaster away from bankruptcy," she said. Healthcare has emerged as hot-button issue during the campaign. Sinema and her rival, Republican Congresswoman Martha McSally, have sparred over last year’s GOP attempt to repeal the Affordable Care Act. Recent polls have shown Sinema with a slight edge in the race, but they’re still within the margins of error, and most political observers consider it a toss-up. They’re competing in Tuesday’s general election to replace retiring Republican Senator Jeff Flake. The winner will become Arizona’s first female U.S. senator. A former state archaeologist is accusing the agency that oversees Arizona's state parks of prioritizing development over protection of Native American sites and artifacts. A Chicago man accused of threatening to kill U.S. Sen. Jeff Flake because he was "tired" of the Republican "interrupting" President Donald Trump will face the federal charges in Arizona. Arizonans are being asked to decide a ballot initiative that would boost renewable energy use. KNAU’s Ryan Heinsius reports, Proposition 127 would mandate half the state’s electricity come from wind and solar by 2030. A proposition on this year’s Arizona ballot is designed to expand the state’s school voucher system. KNAU’s Ryan Heinsius reports, it would make more money available to parents for private or religious school tuition. A man suspected of threatening to kidnap and kill a United States senator and his family had his first court appearance in Chicago.